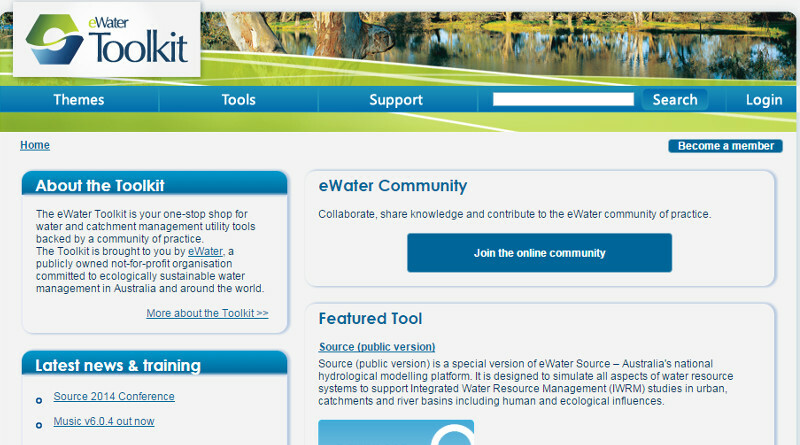 The eWater Toolkit is an Australian web-platform that provides support to anybody working in the field of water or catchment management. It was first released in 2003 by the Cooperative Research Centre for Catchment Hydrology as the Catchment Modelling Toolkit, but since that time has expanded its scope considerably. It presents a wide range of tools and resources, most of which are freely available, and is backed by a community of practice who share knowledge and advice through the online forum. It has more than 12,000 users in over 120 countries, and acts as a web-based distribution point for hydrological, ecological and catchment management models, databases and other resources useful to all involved in land and water management or related areas of R&D. Resources include catchment modelling tools, publications, web links, datasets and online tools, as well as information about training, events and tool updates. Furthermore, it is possible to find geographically-relevant resources using map searches. Some of the content is restricted to Toolkit members, but there is no charge for registering. The Toolkit contains the popular tools RAP, RRL, Aquacycle, CLASS and SedNet as well as information on TIME (The Invisible Modelling Environment), a code-base and algorithm library.